Iyondji Community Bonobo Reserve (ICBR) was established at the request of the Iyondji community, who saw the benefits their neighbors were enjoying as the result of living alongside the Lomako Reserve—specifically job creation and income from tourism. Since then, ICBR has been managed by DRC’s wildlife authority, l’Institut Congolais pour la Conservation de la Nature (ICCN), a valuable AWF partner. The relationship between AWF and ICCN is one of a kind; the work is hand in glove. 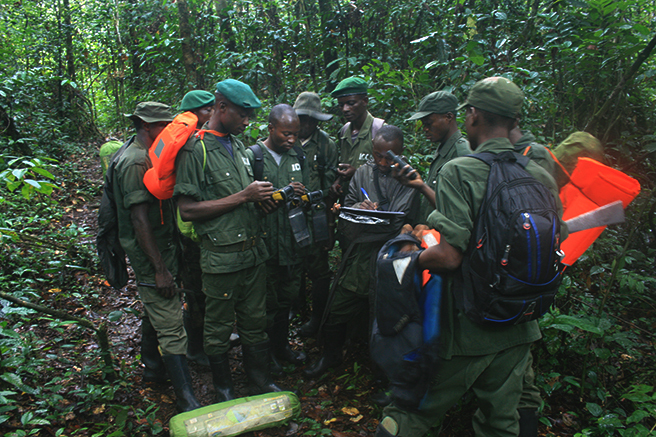 Over the years, to improve sustainable management of the Iyondji Reserve, AWF has provided support to the protected area through Performance Based Management implementation—training the guards on SMART-CYBERTRACKER, paramilitary training to counter poaching, and continued refresher training on counter-poaching techniques. AWF has also provided field gear and rations, while supplementing the guards' salaries. As a result of this support, last year 24 new ecoguards enriched the Reserve’s Management Structure, having completed their combined military and professional training in August. AWF CEO Dr. Patrick Bergin took the opportunity to share with the ceremony attendees AWF’s conservation approach both inside and outside Protected Areas, striking a balance between conservation (species and habitat protection) and support to local communities. In accordance with local protocol, Dr. Bergin handed the equipment over to the Provincial Minister of the Environment, who then passed it to the representative of the Director of ICCN. Finally, the latter passed it on to the reserve warden. All the while, the key message was that good use be made of these materials for the sustainable management of ICBR. Hugues Adeloui Akpona is the Congo Landscape Manager overseeing African Wildlife Foundation's work to conserve biodiversity in Maringa-Lopori-Wamba.